Trans-disciplinary artist, Tanya has an extensive background in dance, theater, media, and literary arts. She has produced and curated several multidisciplinary arts events with her company, Colibrita Productions throughout the Bay Area. In 2005 Tanya was found on the side of the road unconscious from a severe car-accident. Since losing her left eye and her brush with death, Tanya changed the direction of her work to the more personal dealing with perception, identity, and transformation. Besides writing and creating multimedia pieces exploring these themes, it led to the the sci-fi idea of an augmented technological upgrade of her prosthetic eye. An artistic experiment in building a miniature recording wireless device to be implanted in her prosthetic eye, Tanya is currently in development with her engineering team to build a prototype. This eye-camera is not only a way for her to transform her lost eye from a traumatic car accident bionically, but a conceptual and transdisciplinary experiment merging media and performance. Tanya balances her technological and artistic experimentations with teaching media literacy to youth, as well as organizing large scale community art events for Art Inner Sunset in the Sunset District neighborhood of San Francisco where she was born and raised. Looking for ways to heal trauma; EyeTanya is a multi-disciplinary approach to transformation. EyeTanya are captured moments (photography & video) rediscovery of sight, peripheral empitness, and what revelations can come out of acknowledging what we take for granted. The journey of recovery from trauma in the United States is convoluted with debt, bureaucratic institutions, societal ignorance … EyeTanya are words of self-documentation (writing & video) of this process, while the stigma is deep …EyeTanya are also images (photography) parodying and defying labels of disability in an effort to free oneself by reinvention. And finally through performances and time-capturing devices (live multimedia performance, writing, & feature length film) EyeTanya is a model to mythologize oneself by creating the story for a future identity. What a great site. I would really like to talk to you more and get an interview for my blog. Just found your site. My brother lost an eye in childhood to cancer, and I think reading your entries might help me to understand a little better about his world. Best wishes. I lost my eye at the age of eleven, I’m (ugh) thirty now, and have been wearing a prosthesis ever since. I have often thought about the joys a bionic eye could bring and would love it if you could give me updates on your search for engineers and any progress. My own capitalization on the one-eyed life has been through the use of my old prosthetic eyes as a form of currency to pay my tattoo artist to finish my sleeve. Never was I happier to be a freak than when I discovered the joy of bartering! I lost my right eye at the age of 6. I am interested in your project and would be willing to be a test subject when the time comes for that. I have emailed you. Please keep in touch. wow, so many one-eyeds. i lost vision in my left eye from a BB gun shot when i was 15(33 now). torn/detatched retina. I had a prosthetic made but i could never wear it for more than a few hours without it driving me nuts. it sits in a bag in a drawer along with the BB. what a great site. that would be awesome to have a camera eye. I suffered from a fully detached retina in 1983, a time when repairing something like this was still somewhat experimental. After two surgeries and some argon arc laser treatments the eye survived but I lost 99.9% of sight in that eye. It has been a “lazy eye” ever since but hasn’t given me a lick of trouble until three months ago where I had iritis with pain for a few weeks. The lazy eye thing has always been difficult to deal with especially when meeting a person for the first time and looking him/her in the eyes. I often considered having it removed for a prosthesis solely for cosmetic purposes, after a bout of iritis that my retinal specialists was surprised to hear was the first, I’m considering it again. If you had the choice of replacing your prosthesis with a living albeit more difficult for others to look at eye, which would you choose and why? Hi, just like everyone on this website i am 1eyed. and i am just amazed to find this website and to see so many people who is going through the same as i am. I lost vision in my left eye 3 years ago(i was 19), it wasn’t an accident, it was doctors mistake. However, just like all of us here with some time i got used to living like that and it didn’t really bothered me until about a year ago from now. My eye started changing drastically, and bothering me. i couldn’t read much or be on the computer or drive. Being an art student it made it ever more difficult for me to continue with my education. so i said to myself that i cant afford it, and decided to get rid of my eye.I couldn’t be more happier with my decision. not only that my eye looks great, for the most part it doesn’t bother me at all. I look like myself 3 years ago, and sometimes only by touching my eye i remember that it is fake. No one has ever noticed. operation is not painful and recovery is not very long, after a week or two i went back to school, and in two months after operation i got my prosthetic eye. Being disabled is a big topic on this website, however i don’t feel that way at all. yes my priorities has changed and it made me grow up way faster, but i don’t think its a bad thing. Very glad to find all of you guys here, and wish you best luck in everything! I am in the same situation as you it sounds like (similar) because a doctor made a horrible mistake and damaged my right eye and now am contemplating removal of the eye due to intense pain. Wondered exactly what happened to you. Mine was 3 years ago and I am progressively getting worse. Are you happy with the appearance of your prosthetic eye. Are you comfortable with it. Thanks for any info you can provide me. Just read your story again and you said you were really happy with the prosthetic eye, that you barely noticed it. So glad it turned out positive for you. I am sure you had a very good ocularist and ophthalmologist helping you. Thanks for sharing. I never considered the possibility of a monocular community out there. Neato. I’ll be following along. I’m rapidly losing what sight I have in my left eye to cataracts and glaucoma, both related to a childhood cornea injury. I know it’s not the same, but it’s a weird feeling nonetheless. I’m 38. Forgive me for not using my first name; it’s rather unique and I don’t want to air it publicly. I was blind in my left eye since birth, having congenital cataracts since birth. When I was 10 back in the early 1970’s, the cataract was removed and I had 20/20 vision in that eye. It was short lived, however, due (mainly) to a detached retina when I lost vision in the eye a few months later. In the end, the eye was removed and I’ve been wearing a prosthesis ever since. In 1995, I had an outpatient operation where my right eye’s lens, clouded with the cataract, was removed. Since then, I have been able to drive (well, that took about five years before I did so on a regular basis), though my reading speed is still slow. In any event, I heard about your challenge to engineers on Buzz Out Loud yesterday. I think it’s a cool thing you’re doing, and I think it’s even cool that you are sharing your stories and thoughts about such things. While I’m not using my name publicly, feel free to get in touch if you have questions or such. I’ve subscribed to your blog, and looking forward to reading it. Peace. Wordpress connected a post from my blog to a post from this one. My blog is about our nine-year old daughter who died about six months ago. My wife and I have been reading much about grief. One of the books is by Jerry Sittser, A Grace Disguised. In it, he says that comparing loss is pointless. Tragedy strikes each person and each family in uniqe ways. But he says that the process of grief and dealing with loss is very similar whether it is loss of a child (me), loss of an eye (many readers here), loss of an arm (a friend of mine), or the loss of a job (many others). I would recommend his book if you get a chance. Good Luck! You are my HOPE. I’m just happy to have the cancer episode behind me and to have hope for seeing my grandchildren. It took awhile for the golf game to come around, but the brain can make amazing adjustments. I’m also a better driver, having slowed down, and am much more deliberate and focused behind the wheel. This is a great website – humans have a wonderful way of creating blessings from tragedies, and I wish Tanya well with her research. I’d like to help her make a difference. Wow, I am also a survivor of a BB Gun wound loosing my right eye when I was 13 I am now 37. For anyone who has posted they wear a prosthetic lens, like myself Randy Danz, Ocularist in Montclair NJ is one of the best I have found, I wear my prosthetic 24/7 and I cannot even feel it. For anyone suffering with an uncomfortable lens you need to pay Randy a visit. His office is located on Bloomfield ave in Montclair NJ. I hope that Tanya is able to help us with her research for future sight. Did this guy steal your idea? I’m an italian journalist from Max magazine and I would like to ask you some questions. Did you already replaced your eye with the webcam? Which kind of images you’ll film and which art performance will you make with the images you’ll collect? What do you think the webcam can see that the the eye cannot see? Will the webcam be permanente or just an experiment? How your life can be conditioned by the webcam? Will you behave al the time according to the presence of the webcam? I’ll write an article about your experience and your answers will be very helpful. Hi Tanya, you are beautiful! My daughter age 4 lost her eye due to a fighting battle with cancer since age 9 months. It has been a long hard road and was very unclear in the beginning why she really lost eye. Then finally after all her cataract surgies, neovascular glaucoma diagnosis and her high fever that made her eye sink in her orbit, they removed her right eye. I think it was harder for me to deal with more than anything since I have 20/20. 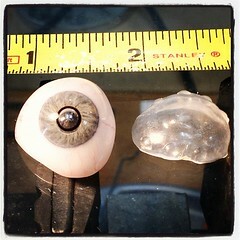 Your prosthetic eye looks amazing! I only hope that my daughter can get one that looks equal to yours. Please email me and let me know who makes your prosthetic. I would also love to stay informed about your new project for the camera. Thank you for being a role model! My daughter wants to model but is scared her eye doesn’t look to normal. I just keep reminding her she’s beautiful and can do anything. Interesting to hear stories from people similarly situated. I’ve lived for around 42 years without my right eye. For many years I wore a prothstetic eye until I decided to stop and start wearing an eye patch about 7 0r 8 years now. For so many reasons I am much happier this way, outside of the seemingly coincidental boom of fascination for all things pirate! Not being the clever opportunist, that took some adjusting to. I would be very interested to hear about your success which I do wish for you. I’ve been looking at your site for the past couple months. I am 27, & recently had a traumatic eye injury. Im a Jet Mechanic on F-16’s in the United States Air Force. On the night of Jan 19, 2011, I took a wrench to my right (dominant) eye while on the job. It seemed like a really bad dream. Ive been through two surgeries to try to save the eye. After seeing the Retina specialist, i got the news that I’ll never see out of it again. I am scheduled to have my eye removed and get a prosthetic May 1st, & i guess i wont get my glass eye 8 weeks after that. This challenge is not so much physical, Granted im in the process of training my self to everything differently, but i think its more mental. Thanks for starting this, glad i could share my story with everyone. Thanks. Question: If you could go back in time to when you went through this and tell yourself something… What would you say? Just saw your project in kickstarter. The Israeli Newspaper Walla, wrote about your project. Its in hebrew, but you will see the title and the links to your kickstarter page. I’m actually writing you to maybe point you out into an interesting technology that might help you on your way. This is a medical device to take films/pictures of the Intestines. This technology is so miniature so i wouldnt be suprised if there could be a similar camera built based on this technology that would fit your needs. Their device is also wireless and transmits the stream to an external device. Most of the information are online. If contacting them doesnt help you contact me, so i can ask around. Yuval, Thank you for writing, I’m excited to see my project has appeared in an Israeli newspaper. And I will check out Given Imaging. Sounds interesting. Hello Tanya, I live in Brazil and your website was mentioned in an article in a technology portal here http://www.tecmundo.com.br/11415-olho-bionico-promete-dar-zoom-e-ate-gravar- in-hd.htm. I identified myself with it, because I lost the vision of one eye in a car accident two years ago. I really like their initiative and creativity. I will keep watching your blog and I support a lot for you. Hugs from Brazil. Or, will your new eye be an wearable ‘camera’ eye prosthesis that enables recording/viewing of the output, for viewing by your other eye or for other people to view? Hello Tanya, I was in tears just a few minutes ago and I did some research and found your blog.. Reading all the positive comments and replies had me wipe my tears away and know that everything will be ok. When I was 4 I was hit in the eye with a dart. I have struggled my whole life. I dusted myself off and always moved forward. I built my confidence and have taught myself to maintain eye contact have been promoted to management positions. I have had the whole retinal surgery and 10 years later.. here I am at 32 needing a prosthetic eye. My eye I have is of no use.. it’s blind, lazy and doesnt pay rent LOL – So I am going to have the surgery 8/1. Thank you for having this blog because I was terrified.. I am scared right now.. but I will get through this right? I will be a swan??? I am an Egyptian man aged 50 years I lost my right eye when I was 10 years old. I found your site upon surfing to find suppliers of artificial eyes.Due to bad quality and high prices that we have in Egypt. In addition of facing a problem in renewal of driving licence,as I had to represent a faked certificate which I do believe totally unfair to stop people like us from living a normal life. I am touched very much for the people who is suffering from loosing one eye specially the adults as they lived with two eyes and it is will be new way of living with one eye but I want them all not to worry as they will be able much more faster than they think to do every thing they use to do before loosing an eye I want them also to feel gratitude that at least they can still see. I just want to know if there is any statistics about the one eyed persons world wide,if so please inform me about the resource. Just wondering how you are doing. I think this website is wonderful and helps people with one eye or are contemplating removal of an eye (as I am due to severe pain) and the more I can learn from everyone the better. Want to say that your eye looks perfect and a beautiful color. What is new with the camera insertion. I think California is a great place to live with the best doctors, etc. Take care. rocky, yes of course! i know rob – and i’m working with his engineer, kosta grammatis.